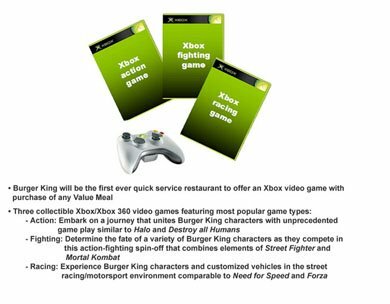 Looks like Burger King is planning on sticking The Burger King in a variety of quick hit one-off games for the Xbox 360. Each game will be cover a different genere, using The Burger King as the main character in each. 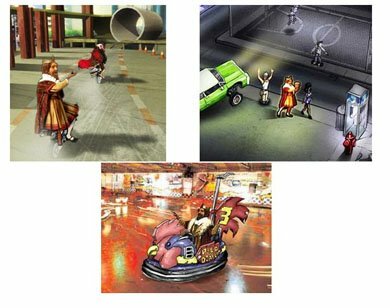 From the concept photos that were leaked to kotaku, it looks like a racing game, a third-person action game and a fighting game(?) seems to be what they're thinking so far. The good news is these little quick games will be relatively inexpensive, around $4 a pop. I'd pick one up if it lasted for more than a few minutes. At first you would think that this would be just a rumor but apparently Burger King has threatened legal action in an attempt to get kotaku to take it down. That in itself gives this story some serious street cred.